>> in the shooting spree in tucson is expected to be released from the hospital today. this as we learn more about what surveillance cameras captured during the tragedy. miguel almaguer is in tucson with the details on that. good morning to you. >> reporter: matt, good morning. investigators found a key piece of evidence here -- surveillance tape which has not been released to the public and nbc news has not seen it, but sources who have tell the washington post it outlines a very gruesome day. 9:54 a.m ., the post sources say jared lee loughner enters safeway. surveillance video reportedly shows the 22-year-old headed to the restroom. here, investigators believe he puts on ear plugs. nearly 15 minutes later, loughner exits the store. the video is said to show loughner walking quickly out of safeway. he circles a table, heads toward congresswoman gabrielle giffords . from two feet away the suspect fires a single round. giffords falls to the ground. the congresswoman hit in the face above her left eye. >> the source we talked to in la law enforcement say this is a gruesome video. it's very clear that it is a suspect resembling mr. loughner. they are holding it for trial and evidence and they say it is something you don't want to see. >> reporter: sources say loughner next fires on the crowd. the gunman turns to his right, shoots john barber , judge roll pushes barber to the ground and crawls on top of them. the two take cover under a table. then the gunman shoots rolle in the back. barber, who works for giffords survived. roll, a federal judge was dead at the scene. vicky stubs and nancy bowman tried to give roll cpr. >> i looked at judge roll and said, i'm so, so, so sorry. >> it was a massacre. >> reporter: meanwhile, most of the injured are now out of the hospital including suzy heilman, the neighbor who took the youngest victim 9-year-old christina taylor-green to meet giffords. her husband said she's been riddled with guilt but christina's father said his daughter's death is not her fault. >> they were doing something that my daughter would have loved to have done. >> reporter: later today , 76-year-old george morris is expected to go home. dorothy, his wife of 50 yearses, died by his side. giffords remains hospitalized in serious condition, a week and a half after the shooting. >> i have spoken to gabby maybe an hour before that. >> reporter: mark kelly is giffords' husband. >> it's just not right. but, you know, she's injured. she lived. she survived. she's going to recover. there are six folks that don't get that opportunity. >> reporter: sources now say they believe 32 bullets were fired here at the crime scene . earlier that number was thought to be 31, but a woman standing near the gunman said a few days after the shooting she found a spent shell casing in her purse. matt? >> miguel almaguer in tucson . thank you as always. 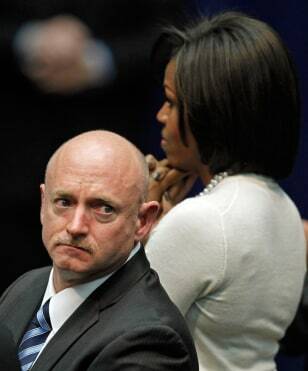 First lady Michelle Obama and astronaut Mark Kelly, husband of Rep. Gabrielle Giffords, listen to President Barack Obama speak during a memorial service for the victims of the Tucson shootings.